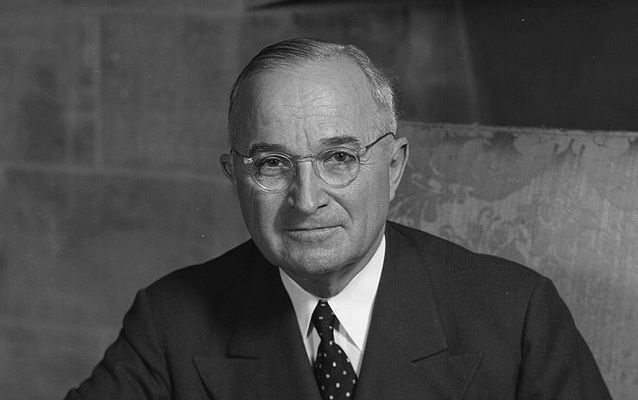 In an address to Congress just days after the celebration of V-J Day in the United States, President Harry S. Truman outlined to Congress what the country must do after World War II. 13 of those 21 policy points remain fully or significantly relevant in 2015, seventy years later. …a host of proposals to address wage stagnation and the ensuing economic malaise of middle- and working-class Americans. Government wage subsidies, educational enhancements, daycare and the other economic menu offerings shuffle income from taxpayers and employers to the middle class. Yet […] the salad bar contains no market disruptors, the essential ingredient to restoring middle class prosperity. The reforms are offered within the conceptual framework provided by Reaganomics that eschews market disruptors. American middle-class prosperity is being held hostage by Reaganomics. Only when reforms offered by Democrats move beyond that conceptual framework by linking wages to productivity can its prospects brighten. Various specifics come up in Tyler’s article (and many of his other articles) with regard to wages, of course. But the bigger picture point here is a good one that many Democrats should do well to take a harder look at: Are we on the left no longer seriously pushing big and transformative ideas because we’re still trapped inside an ideological box (or Overton Window) framed by the rhetoric and views of Ronald Reagan and his legion of devotees now in government? 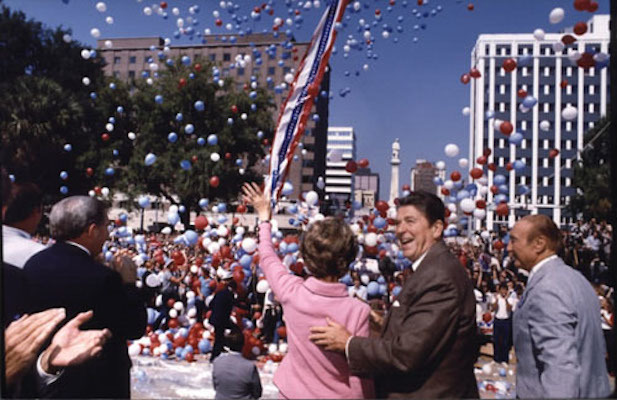 Even many dedicated progressive policymakers, policy developers, and policy activists are perhaps still too constrained in what they imagine in possible and are reluctant to push back — and to push the American people to see government as possible solution and partner, not as the source of all ills like the Reagan Revolution insisted. Again, more on this down the line, but I want to get the ball rolling with the quotes above. This essay was originally published in The Globalist. Whose duty is it to ensure a living wage in a global economy where jobs can be moved easily to more “flexible” jurisdictions? And how is that goal of a living wage best achieved, regardless of any moral responsibility? Increasingly, those questions may have two very different answers, as abstract ideals diverge from realistic solutions in the 21st century. One common policy solution of the 20th century industrialized world was legal compensation floors, mainly hourly minimum wage laws. Companies were simply compelled to meet their duty to workers. The first country to authorize a government role in setting minimum wages was New Zealand in 1894. The United States saw its first state minimum authorized in 1912, just over a century ago. In 1933, that statement was not just a moral argument, but also an enforceable policy position. Today, in many cases, it is not. Large multinational corporations that operate worldwide have more leverage and flexibility in the global marketplace than any single national government. Their transnational character allows them to avoid national efforts to compel them to do their fair share under a more democratic capitalism. 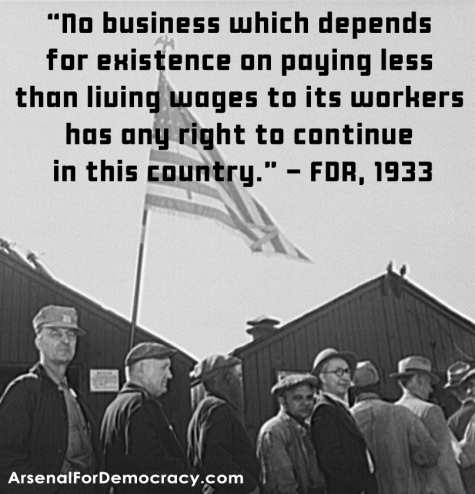 In many sectors, if a large business has – in the words of Roosevelt – no “right to continue [operating] in this country” due to its preference for paying sub-living wages, it can and will simply go elsewhere. The century-old mechanism of a legal wage minimum — while still critical — is losing its effectiveness against poverty and labor abuses due to the radical transformation of the global economy. New mechanisms are now urgently required to supplement it. The underlying goal – the need for a living wage – that once led to the creation of minimum wages have not changed – but the toolbox must expand. Until lately, the issue has stalled. In most of the industrialized world, strong social safety nets often reduced the perceived need for higher wages. Meanwhile, U.S. activists were tarred as closet socialists seeking the Europeanification of free-market America. Everywhere, the poor typically lack political leverage. Their demands are frequently written off as ignorant populism detached from economic realities. But we have reached a tipping point. Even techno-optimists – those who have long boosted the life-easing benefits of the arrival of robots – are now concerned. They are starting to acknowledge that the pressure on wage levels (and employment levels themselves) will no longer just come from cheap, surplus human labor overseas. It will also come from increased mechanization, automation and robotics.